OD Designs "Back Porch" if famous among rockers and has seen some awesome parties. Hosting tribute bands such as BLS, ZZTop, AC/DC. Please feel most welcome join one of our great parties and our group with hundreds of OD Rockers and get notices for who's playing and when. If your a manager for a production company and want to put your band on our famous "Back Porch" speak with Daiseze Dahlstrom for booking. The Party Starts Here! OD Designs caters to the needs of our Bands in many ways. Ask about our sponsorship programs, helping tribute bands build their show. 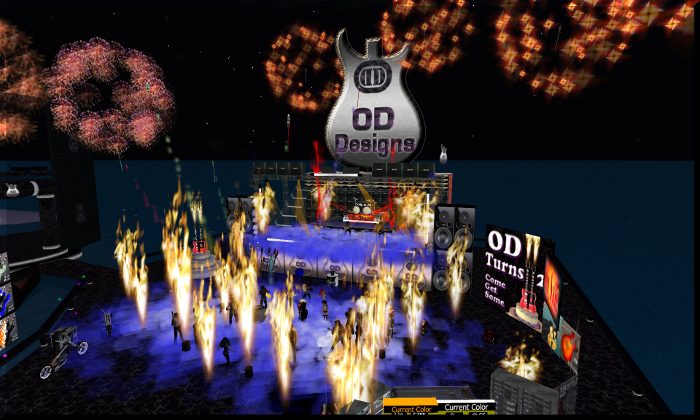 OD Designs has the most awesome equipment available, instruments galore the one that put OD on the map, Guitars, nearly a 1000 to choose from. Within the OD there is a kiosk for sl band members to sign up leaving a small blurb about themselves and what instrument you play. Tribute Band Mangers and Production Companies often look at the website for new fresh faces to add to the many bands they build. Just Click the Kiosk sign up and wait and see who calls for a band member.